This video essay from Vugar Efendi, who has made a habit of putting together simple video essays via edits and juxtapositions that let the films speak for themselves, places real-life footage against their filmic portrayals. From La Vie En Rose to The Fighter to Catch Me If You Can, it lets the viewer decide how well the cinematic recreations pair up with the moments they’re based on. Jackie, once again, comes out looking great, while Oliver Stone’s recreations of the assassination of Lee Harvey Oswald and The Doors’ performance on The Ed Sullivan Show exhibit the director’s decidedly liberal attitude toward staging. 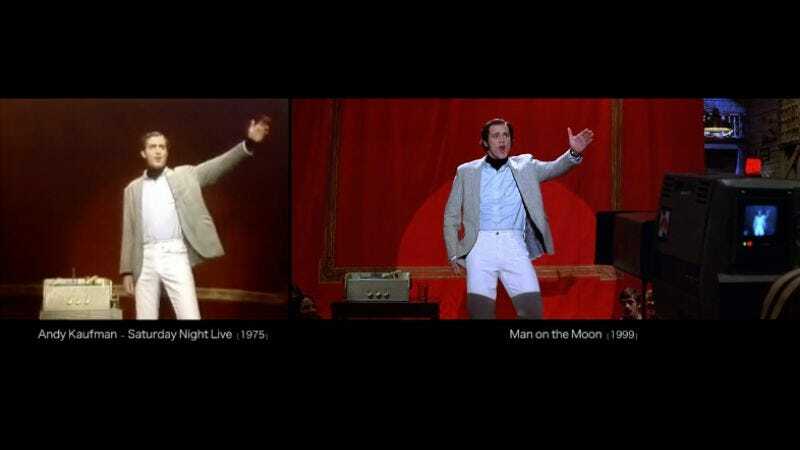 Interestingly, Jim Carrey’s acclaimed portrayal of Andy Kaufman looks a little more cartoonish when seen side by side with the original—Carrey’s eyes survey the audience a bit more, his nerves are played up, and his dance moves are more exaggerated. It just goes to show that accuracy is important, but not essential. Now if someone can find that Joseph Fiennes-as-Michael Jackson movie, we can redo the video and see some real acting take place.